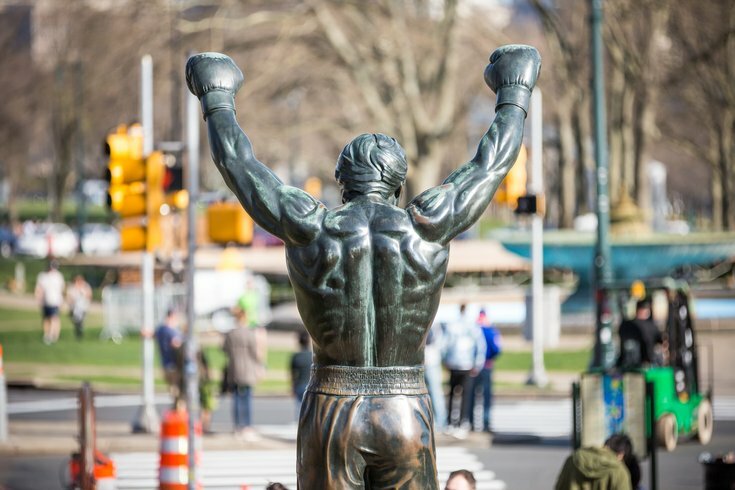 The "Rocky" statue, one of Philadelphia's most well-known tourist attractions, wearing Patriots garb? That's the wager agreed upon by Philly Mayor Jim Kenney if the Eagles fall to the New England Patriots in Super Bowl LII next Sunday. Kenney and Bill Carpenter, mayor of Brockton, Massachusetts, have made a "Rocky v. Rocky" bet ahead of the Big Game. The stakes? Loser has to dress their iconic statue of a boxer in the winning team's gear. The two mayors came to the agreement while attending the United States Conference of Mayors in Washington, D.C.
Philly's statue depicts a famous scene from the original "Rocky" movie in which the fictional Rocky Balboa, the main character portrayed by Sylvester Stallone, reaches the top of the Philadelphia Museum of Art steps while training for his big fight with Apollo Creed. The monument, perched outside of the museum, has become a huge attraction since it was donated to the city after being used in Rocky III. Brockton's statue, on the other hand, memorializes Rocky Marciano, a hometown hero and real-life Rocky who inspired the name and style of Stallone's character. In a Facebook post, Carpenter called the wager "good-natured fun." But will everyone else see it that way? "I don't know how long it'll stay on. We'll have to Crisco the 'Rocky' statue," Kenney cracked in an interview with Washington's NBC affiliate, referring to the so-called "Crisco cops," city officials who took it upon themselves to grease up light poles with shortening to keep fans from climbing on them after the Eagles' NFC championship game against the Minnesota Vikings on Sunday. "It's going to have to be a quick photo for either city," Carpenter added. But the two mayors didn't just put their statues on the line. If the Eagles lose, Kenney will give Carpenter a keg of beer from Yards Brewing Co. If the Eagles dethrone the defending champion Patriots and win their first-ever Super Bowl? Kenney gets some Rocky Marciano wine, inspired by Brockton's heralded boxer.